Any bear or cougar that continues to approach, follow, disappear and reappear, or displays other stalking behaviors is acting in a predatory manner. Bears that attack you in your tent or confront you aggressively in your campsite or cooking area should also be considered a predatory threat. If the bear or cougar does not respond to aggressive actions such as yelling, throwing rocks and sticks, etc., you should be prepared to physically fight back if it attempts to make contact. If you have bear spray, emit a deterring blast, preferably before the bear or cougar is within twenty-five feet. This gives the animal time to divert its advance. 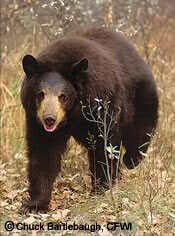 Are usually the result of a sudden encounter with a grizzly bear protecting its space, cubs or food caches. On rare occasions it may be a black bear. In defensive confrontations., the bear is attacking you because it feels threatened. If contact is made, or about to be made, drop to the ground and play dead. Lay on your stomach, clasp your hands behind your neck, and use your elbows and toes to avoid being rolled over. If the bear does roll you over, keep rolling until you land back on your stomach. Remain still and try not to struggle or scream. A defensive bear will stop attacking once it feels the threat has been removed. Do not move until you are absolutely sure the bear has left the area. Always review the latest information on what to do in an encounter or attack by contacting the wildlife and land management agency where you are recreating. Bear behavior varies from species to species and as a result of their individual experiences. There is no one assured protective action to take during an encounter or attack. Polar bear avoidance requires special training and equipment. Always travel with an experienced guide. All cougar close encounters should be considered confrontational and predatory. Be prepared to aggressively fight back. Do not panic! Group together, pick up small children and assess the situation. Prepare to use your bear spray. Do not run or make sudden movements, it may instinctively cause the bear or cougar to charge you. Give bears a chance to identify you as human, and not a threat. If the bear stands up, it is trying to see, hear and smell you better. Talk firmly in a low-pitched voice while backing away. Avoid direct eye contact as bears may perceive this as a challenge or threat. Continue to back away slowly and cautiously, retreating to a place of safety. Monitor the animals response, and adjust your actions accordingly. Whether you hike, mountain bike, float rivers or ride horses, there are precautions you should take. Following the suggestions below will help make the journey safer for you, your companions, and wildlife. Remember, all wildlife can be dangerous. Please do not approach or feed wild animals, especially bears. Human conflicts with bears, cougars and alligators usually receive widespread media attention. However, most conflicts that result in human injury involve other species of wild animals. Conflicts with wildlife are primarily caused by inappropriate human behavior. Many wildland visitors mistakenly believe that there are specific gestures and warning signals wild animals make that will give people time to retreat to safety. Wild animals (including bears, deer, elk, alligators, wild hogs, squirrels and raccoons) are individualistic and unpredictable. Animals that ignore you, look calm, or appear friendly may suddenly and without warning charge or strike out. Human injury often occurs when any animal responds to a perceived threat with instinctive "fight or flight behavior". People get injured simply because they are too close and in the animals way. A car horn, barking dog or excited child can trigger an animal into fight or flight behavior. Both females and males of most species are equally dangerous. If an animal approaches you, it is your responsibility to move away to maintain a safe distance. Black bears are found throughout most of North America, while grizzly, brown bears are only found in the northwestern states, Alaska and western Canada. 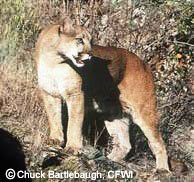 Cougars, (also called mountain lions), panthers and pumas, have been expanding their territory in North America. Every year millions of recreationists have the opportunity to safely observe bears and catch rare glimpses of cougars from observation areas and hiking trails without any confrontation. Confrontations with bears and cougars are very rare. 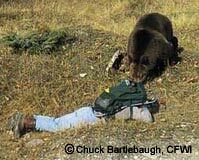 In recent years, attacks are most commonly the direct result of people approaching the animals for photographs, hiking off trails in dense brush, or feeding the animals, particularly bears. 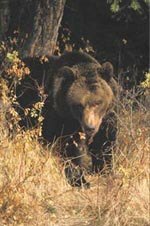 You can minimize the possibility of a confrontation by following one basic rule: Never Approach, Feed or Follow Wild Animals Especially Bears. Bears-Detour as far away as possible while monitoring the bears behavior. If the bear is close to the trail and you cannot bypass it or return the way you came, wait for the bear to leave the trail area. If the bear is approaching you, identify yourself as human by allowing the bear to see and hear you. The bear should divert its direction and avoid you. Cougars-Even at a distance a brief glimpse should be cause for alarm. Though the cougar is most likely to leave the area, you should group together and travel with great caution. If there are repeated sightings, be prepared to aggressively defend yourself and others. Be alert and on guard for the remainder of your hike.